While I am typing this article in `vim', my GNU/Linux box is playing an old Malayalam movie song. The amazing thing is that what the brain perceives as `music' is nothing but a gigantic sequence of numbers being processed and converted to electrical signals by some intricate hardware and software on the computer. A number of libraries are available on the GNU/Linux platform for performing sophisticated mathematical computations on large datasets. Of particular interest to me (and I hope, all fellow Python fans) is the `Numeric' module which brings in high-speed matrix processing to the relatively `slow' world of Python. This article provides an introduction to Numeric by using it in conjunction with two other libraries - `Pygame' and `Matplotlib'. Pygame is a graphics library built on top of SDL (Simple DirectMedia Layer) and Matplotlib is a sophisticated 2D plotting package. There is one very important point to be noted in this example - that the array constructed as a result of calling the function `array' is not in any way similar to a Python list. Had that been the case, we would not have been able to add 1 to it. We also note that the operation of adding 1 to the array resulted in the values of all the elements getting changed and the operation of multiplying the array by itself resulted in an elementwise multiplication. The `length' of the array along this dimension is 3. The function `rank' returns the rank of the array which it gets as its argument. The `shape' of an array is the set which defines the length of the array across each of its dimensions. The shape of the array is (2,3) - ie, it contains two rows and three columns. As long as the total number of elements does not change, it is possible to reshape the array in whatever way we like. In the above example, we first reshaped a 6 element one-dimensional array into a two-row and three-column array. Assigning a value to b resulted in all the elements of that row getting changed to 8. We note that the array returned by `reshape' is not a copy of the original - it is just another `view' into the very same array. This explains the fact that changing `b' resulted in `a' also getting changed. Finally, the shape of an array is just one of its attributes, it can be modified by simply assigning a new tuple. Let's now use the powerful `matplotlib' package to do some simple visualizations. Listing 1 shows a Python script which when executed displays the plot shown in Figure 1. The `arange' function creates an array of numbers from 0 to 6.28 in steps of 0.01. Applying the`sin' function on this array results in another array each element of which is the sin of the corresponding element in the original array. The `plot' function simply generates a 2D x-y plot. We encounter `signals' everywhere. The PC speaker generates sound by converting electrical signals to vibrations. We see the objects around us because these objects bounce back light signals to our eyes. Our TV and radio receive electromagnetic signals; we are literally immersed in a `sea of signals'. Analysis of signals is therefore of central importance to most branches of science and engineering. Jean Baptiste Joseph Fourier, the 18th century French mathematician and revolutionary had an amazing insight that complex time varying signals can be expressed as a combination of sin/cos curves of varying frequency and amplitude. The mathematical techniques which he had developed based on this insight now find application in disciplines as diverse as neurophysiology and digital communication. 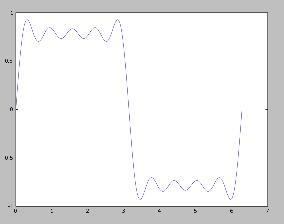 Let's try to visualize a bit of Fourier's math using Numeric and Matplotlib! Listing 2 shows a Python script which generates the plot shown in Figure 2; we note that the graph has become more complex. What if we keep on adding more sines (by changing `range(1,10,2)' to say `range(1,100,2)' in the program)? 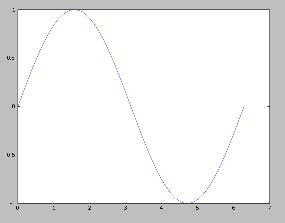 Our graph starts looking more and more like a square wave! As the name suggests, Pygame is a Python framework for writing games. Combined with Numeric, it can be used for doing elementary image processing. My objective behind introducing Pygame is to demonstrate the utility of some of the fast matrix manipulation mechanisms offered by Numeric in a practical context. at the Python interpreter prompt. The program starts off by invoking pygame.init to perform some initialization. A `surface' is an object on which you can perform graphics operations - the pygame.image.load function returns a surface which has an image mapped onto it. The pygame.surfarray.array3d function accepts a surface and returns a 3D array which contains the R,G,B values of each pixel of the image. In this case, the image has a size of 370x158 - imgarray to imgarray represent 1 pixel-wide vertical slices of the image from left to right. The pygame.display.set_mode function returns a special surface - special in the sense whatever is mapped on to this surface will appear on the screen. The first argument to this function is the (width,height) of the surface, the second argument is a flag and the third argument represents `depth' (bits per pixel). The blit_array function copies the contents of imgarray to `screen' and the pygame.display.flip function updates the contents of the display. Before we do a few simple image manipulations, let us examine the very powerful (and sometimes confusing) slicing mechanism provided by Numeric. If step is +1 and start is lesser than end, this gives us all elements from index `start' to `end'-1 in increments of `step'. If step is -1 and start is greater than end, we get all elements from start to end+1. Either some or all these parameters can be missing, as demonstrated by some of the above examples. Say `start' is missing and step is negative - in this case, the start of the slice is assumed to be at the end of the array. Note that modifying the slice will result in the original array also getting modified. The expression a[0:2] gives us a slice of the 3x3 array composed of row numbers 0 and 1 and all the columns whereas writing a[0:2, 1:] yields a slice containing only elements from column numbers 1 and 2. The next expression, a[:, -1], takes the element in the last column from each row and returns a 1 dimensional array. Note that assigning to this slice will result in all the last column elements of the array changing. What about a scaling-down operation? We simply choose alternate rows and columns from the original array by slicing both the dimensions with a step of two. Interested readers should first construct a small 3D array and play with it a bit to understand what is really happening here. The Numeric Python module contains many other facilities - you can solve linear equations, compute fast fourier transforms etc. Both Pygame and Matplotlib are sophisticated programs and a short article like this does not do justice to either of them - I hope readers have been sufficiently motivated to explore these wonderful tools on their own. If you are a Python newbie, a great way to get started is by reading the book `A Byte of Python' written by Swaroop C.H and available online at http://www.byteofpython.info. A PDF document explaining the working of the Numeric module is available for download from http://numeric.scipy.org. O'Reilly Python Devcenter has published a series of very informative articles on Numeric Python - if you want to understand more about `broadcasting' or wish to analyze audio files, go ahead and read them at http://www.onlamp.com/topics/python/scientific. My motivation behind the Fourier series example is an article written by Chris Meyers available at http://www.ibiblio.org/obp/py4fun/wave/wave.html. Chris has also written a handful of great educational Python programs ( including toy Prolog/Lisp interpreters, digital circuit simulation etc) all available for download from http://www.ibiblio.org/obp/py4fun/. The Pygame source distribution comes with a nice set of tutorials - the image manipulation examples in this article have been taken from the `surfarray' tutorial. You will find a repository of Pygame code at http://www.pygame.org/pcr/repository.php/ - I suggest that you look at the code for `real-time flame generation' to get a feel of some of the magic that can be done with Numeric and Pygame.